Your on-farm requirement. Enjoy healthy stock, better pasture, clean waterways. Optimate is a A BioGro certified, naturally occurring mineral that can be added to Livestock rations. Optimate has an extraordinary ability to absorb, adsorb, hold, release, and exchange chemicals, nutrients and toxins according to conditions of the surrounding environment. 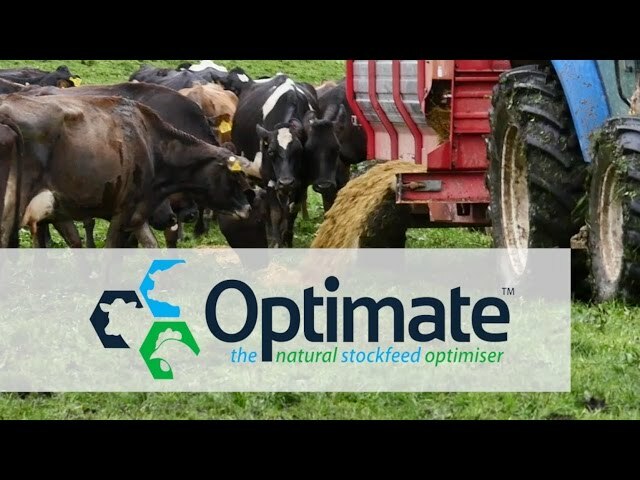 Feeding your livestock Optimate will provide many benefits - from optimising animal health and production to reducing nitrogen leachate in the environment. Optimate comes in either: 25kg bags, 1000 kg bulk bags or by augertruck load. Or packaged to your requirements. Visit www.optimate.co.nz for more information. The best way to mix Optimate is using TMR or in-shed feeding systems. For simple health and performance enhancing substitute at 2.5% of total DMI mixed with existing feed supplements. For toxin reducing, the longer Optimate is in contact with feed material the more likely it will significantly reduce aflatoxin levels. Depending on whether you are looking at prevention or recovery you can feed between 2.5 and 5% of DMI ( or 100-200gm per cow per day) depending on what you are wanting to achieve.